It was nice to see the switch between the land of the dolls and the human world. As a 15 year old, however, the writing does not interest me and the plot is predictable. The dialogue may also come off as cheesy. However the writing is good and if I was younger, I would be able to learn a lot of new vocabulary. The book should be targeted to kids of 10 years old or below. My favourite part was when the author was describing the surroundings of the Krakow or the toyshop, the descriptions are enchanting. I would have liked to see a better plotline. I would give it 3 stars out of 5 stars. I really enjoyed the book and I thought that it was written very well. It is filled to the back cover with cliff hangers, and portrays the experiences of the people of Poland superbly. It has quite a sad undertone, and is driven on by the impressive structure of the book. Throughout the book the pages are bordered with some very detailed drawings. I also liked the flashbacks of the book explaining how the main character Karolina got where she is. I think that the author could have explained how the dollmaker lost his leg in more depth. I would give this book 4 stars out of 5 stars. 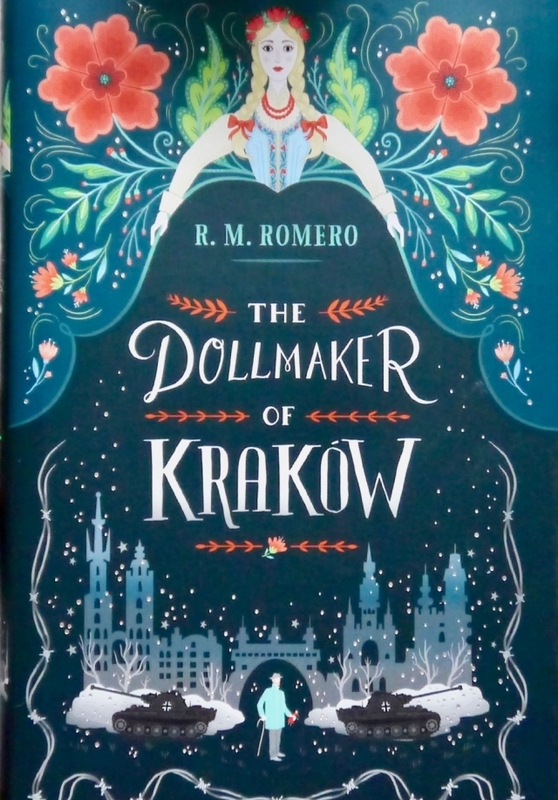 The Dollmaker of Krakow was an interesting but slightly boring book as at times it was uneventful. The characters were interesting and original and heped draw you into the book and the story, although it took time to start, was really engaging and portrayed a different side to a history book I had never seen before by incorporating fantasy worlds. Imagine if you owned your own doll shop. Imagine if your hands could make dolls which come to life. R. H. Romero did just this but inside Krakow, set during the 2nd World War. The dollmaker creates a doll called Karolina who mysteriously one day comes to life. The dollmaker believes that everyone has a part of magic in them and this is why hedecides to take Karolina along to meet Rena, a small young beautiful girl who received a doll house for her birthday but all of their times spent together soon all got forgotten as they have a mad race around trying to save some of their Jewish friends from being captured and taken into concentration camp. I thoroughly enjoyed this book whilst as well as teaching me about history, it also told me about how people were treated. I recommend this book very much to anyone who enjoys historical novels. When Miss gave me this book to read I thought it was more aimed at girls but actually it wasn'. This book is set in Poland during the Second World War and is about a doll, Karolina and the adventures she has with the toymaker. There is an element of fantasy to this story because Karolina can talk and this makes the story really good. There is also a story within a story. Karolina meets a little girl when her father asks the toy maker to make a dolls house for her birthday present. This is how everyone meets and manage to stay in touch even when her new friend and her father are taken away into the ghetto. There were some quite sad parts to the book but I felt it did tell the story of the Nazis in Poland well. There is a Nazi officer who is really mean even though he pretends to be their friend but I didn' like him, he was just looking after himself. However, at the same time the book is set back in Karolina world of toys it is a bit like the Nutcracker from the point of view. I was sort of happy with the end, but I' not going to say more than that because it will give too much away! I do like reading books set during the Second World War and this was slightly different than things I have read before.Â I enjoyed it but don' think I would like to read too much more like this, because it could be a distraction from the history in what was after all a serious book. Krakow, Poland, The Second World War has recently begun and a doll named Karolina has been brought to life by magic. The Queen and King have been overthrown by rats and she is seeking sanctuary with her creator, The Doll Maker. This book, being a children's story, ran relatively slowly but smoothly. It included themes of magic and make-believe along with the harsh reality of what happened during Nazi rule. We would recommend this book to our friends but only someone relatively mature and with understanding of this topic. The doll maker of Krokow is a tale about the adventure of Karolina, a doll who mysteriously arrives in the workshop of gruff and heartbroken Dollmaker, who has magical abilities and brings her to life. The story is about how the Dollmaker and Karolina have to go through the growing cruelty and destruction caused by the German Occupation and how they try to save a Jewish musician and his daughter, who they have befriended, from Nazi persecution. A major highlight of the book is how it juxtaposes fantasy and reality. It does this through moving between the land of the dolls, a place where houses were made of candy and toffee apples grew on trees, which has been overthrown by the morbid, selfish rats and Krakow, Poland, during the dark and gloomy days of World War Two. My favourite character in the book is undoubtedly Karolina, soft hearted and compassionate, she will stop at nothing to help her friends, no matter what danger. She is definitely an inspirational character, one who will remain in the memory for a long time to come. The writing is of a high standard making it extremely enjoyable. The historical detail within the book is interesting and also accurate. The book very cleverly weaves this together with fantasy and for this reason is likely to appeal to all type of readers. The cover of the book is particularly engaging and this more than anything else is what first drew me to it. The enchanting and fascinating choice of colours used on the cover of the book is in a direct contrast to the dark and sad tale that is told inside it, which adds to the mystery. Some of the fantasy aspects in the book, such as the doll becoming alive, are far-fetched. However, this when contrasted against the hard hitting reality and horror of what is happening around Krakow, is what makes the book so fascinating. Overall I was extremely pleased with this book, which was gripping, unique and certainly thought provoking. The book took me through a whirlwind of emotions, making me smile, chuckle, smile and even cry at particular points in the story. Reading this book has whetted my appetite for wanting to read similar books about this particular time period in history. I would thoroughly recommend this book and would encourage the author to write more such books! The story follows Karolina, a doll brought to life, and the Dollmaker. Although childish in its premise (which is only what one could expect from a book written for children), the story displays a powerful message that hope is necessary and can be found in even the darkest times. It highlights in a simple yet thought-provoking manner how the Nazis systematically persecuted a number of groups. In the story, two of those prosecuted are Jozef and his daughter, Rena, who are Jews living in Krakow. I found the description of their emotions when they are forced to leave their home particularly important for Romero to show not only how the Holocaust affects a wide array of people who are often forgotten as people and remembered as statistics, but also to emphasise the effect on individuals who lived, breathed, and contributed to society before their persecution. Not only this, but Romero uses the novel to show how propaganda under the regime affected people's overall outlook of the world by connecting the daily lives of the people in Krakow to a world we are familiar with and recognise as our own. For example, I found the quote, "the newspapers (whose ages seemed to weep with the news they carried)" harrowingly necessary to show how their lives were not too different from our own. Along with this, Romero incorporates Polish folklore into the story, helping to appeal to the audience, but also educating them on Polish culture as well as on the historical context of the novel. For example, Karolina refers to a man who can turn straw into gold; I interpreted this as a nod to the German fairytale Rumplestiltskin. Despite the story's fantastical elements, however, it does have a lot of historical context, such as ghettos, concentration camps, and Nazi laws released by Adolf Hitler during his dictatorship. The beginning of Chapter 14 was especially haunting for me because it illustrated how the Nazis oppressed Polish culture. Romero uses Karolina to show the harshness of their regime and the unfairness of their laws by connecting them to crimes all ages would recognise ("In October 1939, the Germans created a terrible new rule, one that allowed them to steal names.") She connects the story of the Nazi's treatment of Poles (and the other persecuted groups) to a fictional dictatorship set in the Land of The Dolls, an aspect of the novel that immediately reminded me of Tchaikovsky's The Nutcracker. The dolls are used as forced labour to the Rat King, who destroys the old monarchy ("Your old king and queen have been burned to ash- as you will be too, if you don't learn your place," was a disturbing quote for me.) This story is symbolic; the dolls are pure and innocent, like those who lost their lives in the Holocaust, whereas rats are typically bringers of death and disease, and represent the Nazis. This section of the novel encourages younger children to establish empathy with the victims without knowing or even understanding the historical context. In conclusion, the book itself has no obvious flaws, but it wasn't aimed at my age group. Romero is undoubtedly a talented writer, as shown by the various literary techniques she uses in the novel. I would recommend this book as victor for the Young Quills Historical Fiction Award as it would highly appeal to a younger age group. The time period is well established, and the story is saddening, and yet it shows that even when the world seems so dark there will never be light again, there is always hope. I did enjoy this book because is about a doll maker who made a doll that magically came to life and they became best friends. They try to save their friends from death, they live in Krakow in Poland. The war happened in 1939. This book is about a doll that came to real life in a doll store and she became friends with the doll maker. The pain in the book was too much and during the war with their friends and the doll the magic, she had to defeat the other Amy. The doll and the doll maker tried everything that they can to save their friends and the doll was really powerful, she did everything that she can and she saved their country and everyone was saved but the doll maker. I proper enjoyed the book as well, I finished the book under one week . And the doll's name was Karoline; they don't live in a house they live in a store. The part that made me happy was when Karoline came to life, I never thought that she going to come to life and she was the most powerful doll that I have ever seen. It felt like I was there when the story was happening. I want there to be a movie about the book and I want to keep reading it over and over again. The book is so good that when I finished it I start over again. Now I want to read different books that can make me feel the emotions, books that are amazing, books that can make you happy and that can make you cry. That book made me to want to find out what is next in the book and let the book keep going and now what is next? It made me want to meet the author. I want him to make some more about the book and never stop writing and it felt like I am the one writing the book. This book makes me feel like I am the best reader in the world and now I just focus on my reading. I learnt a great deal about how the Nazis controlled Poland and how people's lives were affected by this.